What originally began as a consulting firm for foot health companies, CEO and President Dave Higgins with years of experience under his belt seamlessly turned ING Source into a leading manufacturer of wellness goods. The innovative company currently holds several revolutionary patents and produces specialty foot condition products that strive toward makING life better for each and every consumer. 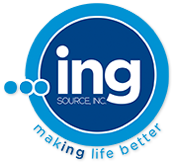 With this in mind, Orthotic Shop proudly offers a number of ING Source products for you to consider. For instance, the FS6 Plantar Fasciitis Compression Foot Sleeve is the highest-selling foot brace on the specialty running shop market with over 1,000,000 sold to date. Developed with Compression Zone Technology, this product has been shown time and time again to relieve discomfort caused by plantar fasciitis. In addition to this renowned foot sleeve, Orthotic Shop also carries other products to help alleviate lower limb pain. Take control of your condition today with Orthotic Shop's ING Source compression sleeves. Dave Higgins founded ING Source as a consulting firm for foot health companies, but realized that there was an underserved market in dealing with common foot conditions like Plantar Fasciitis. Using his knowledge of the orthopedic market, he designed the FS6 Compression Foot Sleeve. Since unveiling this revolutionary design, ING Source has sold more than one million of that design alone, and expanded the line to include calf and ankle compression sleeves as well Designed with the active lifestyles of athletes in mind, ING Source products can be used by customers in all walks of life. Utilizing compression technology, these sleeves by INGSource will help promote circulation, reduce swelling and allow for healthy recovery to those suffering from many common foot conditions. Orthotic Shop is pleased to offer these innovative products by ING Source to our customers looking for compression solutions for their foot, ankle, or calves.